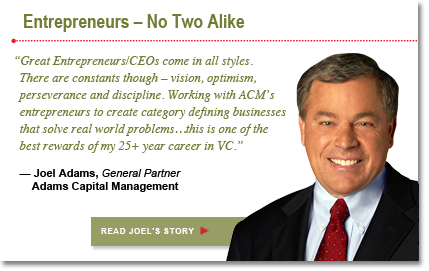 Joel founded Adams Capital Management in 1994 and raised $815 million of capital since inception. Before establishing ACM, Joel served for eight years as Vice President and General Partner of Fostin Capital Corp., a Pittsburgh-based, family-owned investment firm. Prior to Fostin, Joel served for seven years as a nuclear test engineer for General Dynamics, where he managed chemical, electrical and mechanical engineering teams and directed nuclear power plant sea trials. Joel is a member of several charitable organizations, a Trustee of Carnegie Mellon University and a frequently requested speaker on the topic of venture capital. Joel has also received a number of distinctions throughout his career, including a Lifetime Achievement Award from Pittsburgh Venture Capital Association, the Distinguished Alumni Award from Carnegie Mellon University’s Tepper School of Business and the Graduate of Distinction Award from Midlakes High School.